WARNING The rear hatch must be closed securely before driving. An open rear hatch could allow dangerous exhaust gases to be drawn inside the vehicle. For additional information, refer to “Exhaust gas (carbon monoxide)” in the “Starting and driving” section of this manual. 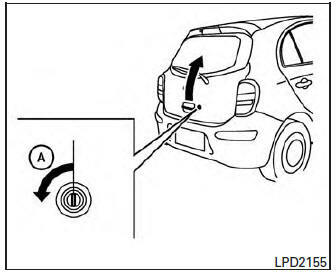 To open the rear hatch, unlock it with one of the following operations, then pull on the handle. Push the power door lock switch to the unlock position. Unlock all doors using the key A (if so equipped). the remote control once. For additional information, refer to “Remote keyless entry system” in this section. To close the rear hatch, push the rear hatch down until it securely locks.